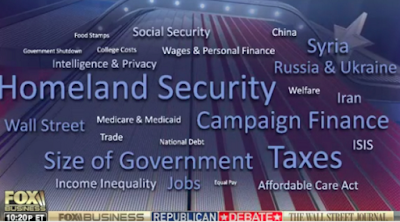 Doug Ross @ Journal: Can You Guess the Missing Word From the Fox Business Debate Word Cloud? Can You Guess the Missing Word From the Fox Business Debate Word Cloud? If there's any doubt that Fox News has a particular, eh, bias against a certain policy issue near and dear to most Americans' hearts, the outlet's word cloud says it all. Can you guess which word is missing? Hint: it begins with an I and ends with MMIGRATION. During the fourth Republican presidential debate, Fox News flashed a word chart in which the size of words corresponded to the alleged concern about the words, the larger the words the greater the alleged concern and the smaller the words the lesser the alleged concern. Conspicuously missing was a term that, according to Google Trends over the last month, has garnered more search interest than any of the putative top four concerns on people's minds has. By the way, the word "border" is also AWOL from the word cloud. And so Fox hides the issue of immigration in support of the GOPe's (eh, I mean, the Chamber of Commerce's) mindless pursuit of importing cheap labor. As an added bonus, Fox gets to avoid cries of racism by the delicate flowers in academia and the media. Where are the useless GOP Congress ?